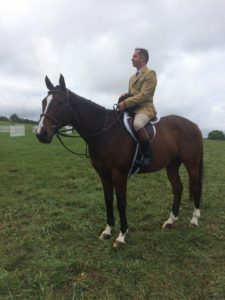 Brian Jarvis and his OTTB General Skye won the first TRF Second Chances Challenge Trophy at the Piedmont Fox Hounds Hunter Trials last weekend. A bold, bay Thoroughbred who cut an impressive figure on the Virginia foxhunting scene took home the first TRF Second Chances Challenge Trophy last weekend at the Piedmont Fox Hounds Hunter Trials. The elegant OTTB General Skye, 11, and his owner/rider Brian Jarvis were judged to be the most impressive Thoroughbred team moving across the spectacular grounds in view of the Blue Ridge Mountains, says Elizabeth Beer, development officer of the Thoroughbred Retirement Foundation. 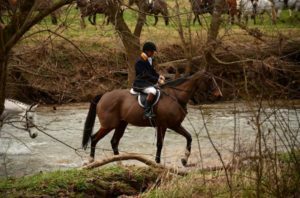 After making his interest clear to General’s past trainer Neil Morris, Jarvis was able to obtain the horse soon after and introduce him to foxhunting. And best of all, General has never met a jump or a fence he can’t trot, he adds. After a particularly good ride at Piedmont last weekend, Jarvis says he was taken aback to learn the pair had the distinction of winning the Thoroughbred Retirement Foundation’s Second Chances Challenge Trophy.